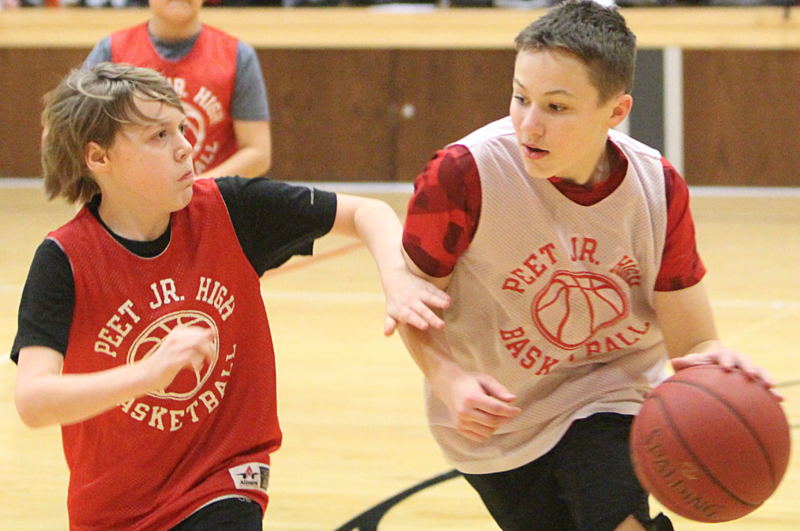 Peet Junior High seventh grade boys basketball scrimmage during practice. 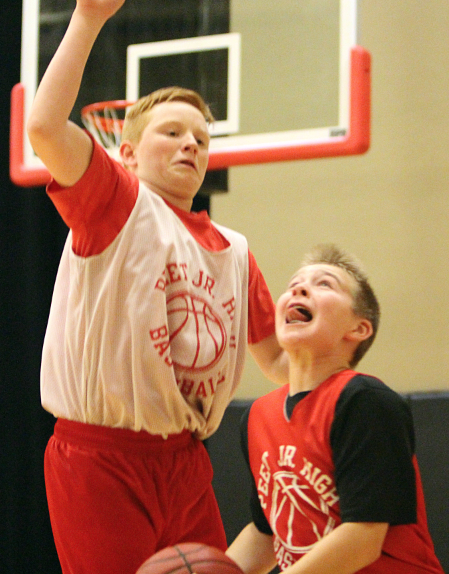 In the 2018-19 season, 42 boys participated in the sport. They plan to improve their shooting in the current season. 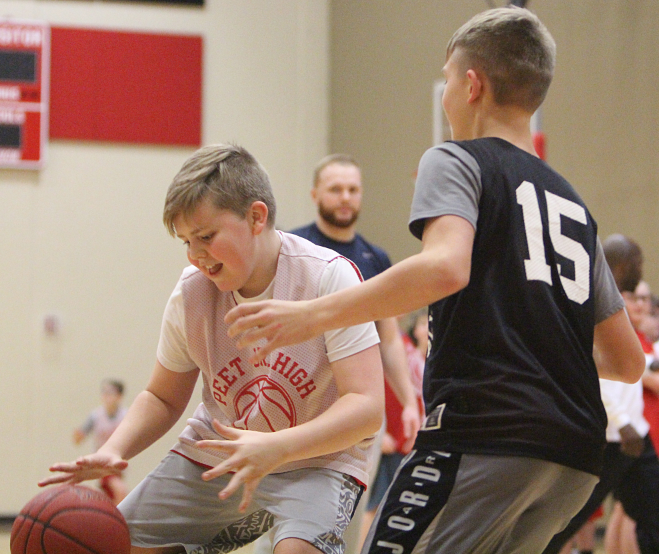 Head coach Demetrius Kimbrough and assistant coaches Tony Cristoforo and UNI student Austin Smith welcomed 42 boys to the first seventh grade basketball practice on Jan. 2, including Ethan Beneke and Jacob Williams. Both boys signed up for different reasons. 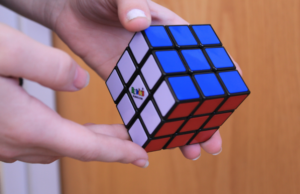 Beneke said he signed up because of all the hard work he puts into the sport, and Williams said he signed up to try out a new experience and see how it goes. Kimbrough has big goals for both of them along with the rest of their teammates. Kimbrough has been playing and coaching basketball ever since his childhood. He played high school basketball at Northern University High and went on to play one year of basketball at Ellsworth Community College before a serious injury prevented him from continuing to play. 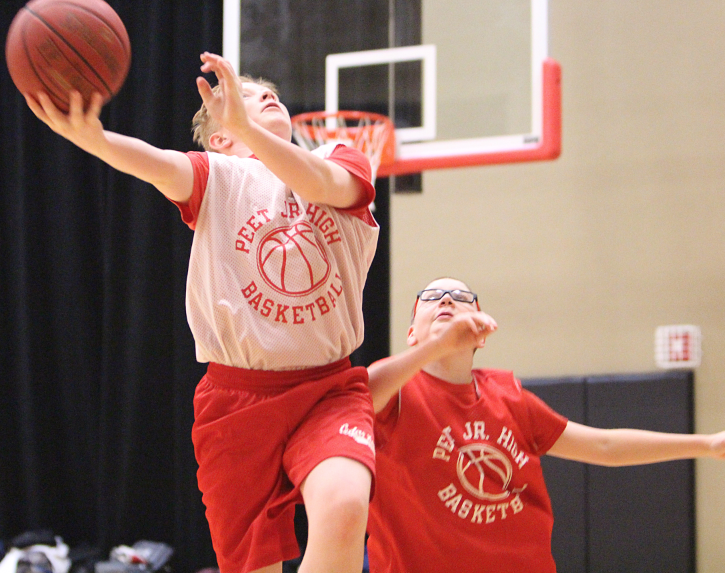 “I still like to play in rec leagues and pick up games from time to time, and enjoy going and watching. Whether it’s youth all the way up to the pros. I definitely enjoy the game,” Kimbrough said. 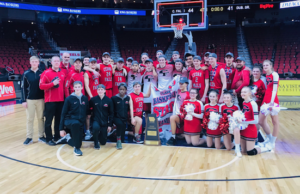 He coached youth AAU ball for the Iowa Outlaws basketball program for three years and was the assistant coach for the eighth grade team at Peet before seizing the chance to become head coach for the seventh grade team. Some goals Kimbrough has for his team are to decrease their average number of turnovers in each game and to improve their team shooting percentage by five percent each game. Kimbrough said that the team likes to work hard and will work to continue to make progress to improve every single game. The boy’s basketball team has games at 4 p.m. on Jan. 15 at WCS, Jan. 17 at Bunger, Jan. 22 at home, Jan. 24 at home, Jan. 29 at Central, Jan. 31 at Holmes, Feb. 5 at home, Feb. 7 at Hoover, Feb. 11 at Carver, Feb. 12 at home and finally Feb. 19 at home.